Goofs: There are lots of references to IE (International Electromatics) technology which seem to suggest that it's still operating. But we know from Millennial Rites and Who Killed Kennedythat IE no longer exists, and that Ashley Chapel used the technology to set up his own company. How did the Soviets monitor the Waro's arrival on their radar if the British radar system didn't detect it? On page 105, Yates says that the lights in the sky were 'last Thursday'. However, the "meteor shower" that caused them is said to have been 'last night' (page 34) when it was Saturday (page 36). If the festival finished on the Friday (Viscount Rose complained that he wasn't allowed to hold it over the weekend), then what are people still doing on the site on what has to be at least Monday? The Doctor deduces that the Waro have been coming to Earth for centuries because they are mining Cobalt and Cobalt is derived from the German kobold - meaning Gremlin. This is a rather dodgy deduction - the link could be due to all sorts of things. It also implies that humans were able to beat the Waro centuries ago. Also, if they have devastated worlds and are old enemies of the Nedenah - beings from another solar system - why have they never tried to conquer any of the Solar System's inhabited worlds before? The Brigadier and Major Houghton both believe that the UNIT conspiracy went to the highest level, but seem surprised that it went as high as Major-General Hayes. Surely if it goes to the highest level, then it includes people at very high levels. The Doctor claims that the Waro have devastated whole worlds, but he's never come across them before - how does he know that it wasn't just a desire when he went soul-catching? Their tactic of destroying entire ecosystems with Cobalt-60 seems a bit strange given that there's none of it on Triton. The Brigadier claims to have last been in Geneva eight months ago, and that that was reporting on the events of Inferno. However, there is no way the gap between these two stories is that long. Technobabble: The Nedenah have heuristic security devices. Continuity: A liberal coalition is in power in the UK. Liz is said to be a meteor expert, a medical doctor and a quantum physicist, as well as having an IQ of over 200. The Doctor claims to be a tenth dan master in all the major martial arts disciplines - Venusian aikido, Saturnian kung-fu, and training as a Ninja on Quinnis in Galaxy 4. [The latter two are probably made up]. He links the constellations of Sagittarius and Kasterborous, though the Gallifreyan concept of a constellation is different. It isn't fixed by location, as time and relativity are involved. He says that Gallifrey is 30,000 light years away at the Galactic core. The Time Lords have a rite called 'Soul Catching', which allows the mind of a dying Gallifreyan to be transferred into another's mind prior to assimilation [into the Matrix. This is similar to what happened to Quences in Lungbarrow.] The Doctor was never very good at this technique. The Time Lords removed [some of] the Doctor's knowledge of the future when they exiled him. Ralph Cornish (The Ambassadors of Death) has recently been put in overall charge of the British Space Program. Professor Bernard Trainor is in charge of the British Rocket Group, and has been instrumental in getting useful information about Neptune and Uranus from unmanned probes. UNIT US discovered a 'second' Silurian chamber in Oregon. Bill Filer (The Claws of Axos) is UNIT New York's Intelligence officer. Captain Jimmy Munro (Spearhead from Space) went back to the regular army before going to UNIT Geneva. The Brigadier appears to be fairly fluent in French, and can deliberately put on a really bad accent. The Waro come from Triton, and passionately hate everything. They have green blood, and artificial wings which can be jammed. Their cobalt-60 bombs destroy entire ecosystems. They have genetic and chemical limitations to their anger, turning it against the non-Waro. Removing these limits will eventually overload their nervous systems - they will die of anger. Green Door is the UNIT code for an operation to track a fugitive. The Nedenah have been visiting Earth for thousands of years. They establish links with an Australian Aboriginal tribe. Their spacecraft are silver eggs, and can create the illusion from inside of being made of transparent material. The hulls can shed layers. The CIA captured some Nedenah in 1947. They have also plundered some alien spacecraft designs - including from the Nedenah, [the Tzun], and the Daleks (one of their designs looks like a Dalek ship seen on Aridius in The Chase). Viscount Rose is 37th in line to the British throne. Yates' full name is Michael Alexander Raymond Yates. The Julasen sent a massive fleet that attempted to land in Argentina. Links: The Doctor mentions a perigosto stick. He also mentions Quinnis (mentioned in The Edge of Destruction) in Galaxy Four (Galaxy Four). There are several mentions of International Electromatics (The Invasion). There are minor references to The Web of Fear, The Invasion, Spearhead from Space, The Silurians, and Inferno. Bernard Trainor mentions Rachel Jenson (Remembrance of the Daleks) and Ian Chesterton - including a comment about Vortis (The Web Planet). 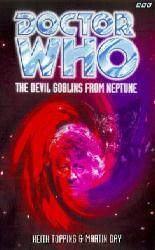 Major Turner (then Captain) from The Invasion and Major Cosworth (The Mind of Evil) are mentioned. Location: The USSR (Gorkiy), Manhattan, Redborough, Cambridge, UNIT HQ, Siberia, Salisbury Plain, Ranch 51 in Nevada. It is summer. The Brigadier's last trip to UNIT Geneva was eight months ago, reporting on the Stahlman fiasco [which, by my reckoning, makes it October]. It is four days to the Summer Solstice. Future History: The [Gallifreyan] concept of a constellation becomes redeemed by human science in the far future. Unrecorded Adventures: The Doctor mentions spending a considerable amount of time in the Peninsula. During this, he was with a British rifle brigade when he met Sir Arthur Wellesley, and was a prisoner of the French at Salamanca in 1812. He also mentions the time he met Puccini in Milan. Thirteen years ago, the Doctor joined the Progressive Club in Mayfair. He claims to have met Lenin during the October Revolution (his last visit to Russia) and Tsar Nicholas at the Drei Kaiser Bund of 1871. Some years ago, Erich Weiss showed the Doctor how to relax the muscles in his arms. The Doctor claims to have known Joseph the second of Austria-Hungary. He claims to have shown Jacques Cousteau everything he knows, but this is revealed as mere name-dropping. In his first incarnation, he fishes the coral reefs off the Santa Cruz Islands. The Bottom Line: A classic UNIT story. Although Liz seems mostly superfluous and the action in Siberia seems a bit repetitive, the story works very well. It's great to see the Brigadier portrayed as a very competent army officer rather than a buffoon. Yates struggling with the responsibility of command is very good characterisation. The Waro's plan and the global scale are quite well done. However, the introduction of 'soul-catching' betrays a weakness in the plot and the Waro's background is less than convincing.